I am so very delighted to have your latest letter. It is wonderful news that your husband recovered so well from his bout with typhus, and had the leisure to spend some time with his little son. It is disappointing I know not to have him accompany you to Vienna, but since he is no courtier, that sort of society would probably not suit him at all! You can deal better with all those dignitaries. I remember well meeting his lordship (How we would all have stared to think of him so denominated!) some years ago at Malta. We had all been dragooned into attending a concert and Hornblower was beside himself with ennui—he did not know a concerto from a fandango, poor fellow, and the expression on his face! I am sure he was playing whist games in his head the entire evening. We all had smoked out his problem, but he hated to have it known, so mum’s the word. As for Croft and myself we are very happily situated. Kellynch-hall is a fine old place, if a little neglected. I fancy Miss Elliot had a mind above housekeeping, the kitchen stove was a disgrace. Croft found himself disconcerted amongst so many looking glasses—the baronet is a fine looking man but, I am sorry to say, very conceited, and surrounded himself with mirrors. Croft did not have the courage to reveal his feelings in the matter to such superior (if somewhat idle) servants, so between the two of us we shifted most of them from his bedroom to one of the unused chambers. I can speak freely to you, dear friend, on another matter. We have had my brother Frederick with us at Kellynch, and despite his stated desire to be caught in “parson’s mousetrap” he has not as yet “spread his canvas to bring home a prize” as my Admiral would say. The neighborhood boasts some amiable young ladies to be considered, but he has been sheering off, and tacking about, but refuses to grapple—to continue the nautical language. No “light frigates” these (the shocking slang can be excused in a private letter! ), but two very pleasant sisters, and from a well enough landed family, but as for me—no, I am not quite sure that either of them would do. Frederick is fastidious, and his old failed romance has not faded from his mind. He never told us who she was, but always spoke of her beauty and delicacy, and in such glowing terms that these Miss Musgroves cannot equal, at least in my opinion. One of them injured herself severely just recently when they all went off on a trip to Lyme—heedless folly, but Frederick felt himself responsible. He was quite disturbed after, and I felt that perhaps he was really in love at last, but he sheered off again, and went to visit my brother Edward when he should have been in attendance on his lady. We await developments! I kept this letter open to describe my new bonnets, but I have more interesting news to recount. What do you think was sprung on us just yesterday. The two young ladies I was telling you of have come to Bath to buy their wedding clothes! Both of them are engaged—and not to Frederick (what a to-do that would be if they both were)! The elder is to marry her cousin, a young clergyman and heir to a small estate, and the younger is betrothed to James Benwick. You will not know of him, he is but a commander, although Croft speaks quite highly of his merits. It seems that he was at Lyme, staying with Captain Harville (another excellent officer, I think Admiral Leighton may have known him around the time of Copenhagen) and came to know Miss Louisa Musgrove during her recovery. This leaves Frederick with fewer choices, but I have a notion about him that I will tell you in another letter—so that you will look forward to receiving it! But I must tell you of one bonnet at least before I close this too long missive. It is quite a la mode to wear long pokes, and so I have bought one in chip straw, with velvet ribbons in dark green, and ornaments of silk fern—it looks quite pastoral, without being laden with flowers. It is just the thing for my green spencer, which is precisely the same shade. I enclose a snip of the muslin I have bought for a gown to go with it all, what do you think? I will be very smart without looking as if I were trying to be a young Bath miss. Apropos of youth—I know that Sir Walter Elliot can scarcely contain himself but to recommend Gowland’s lotion to me, he would almost tell one to gargle with it—but I content myself with the Water of Ladies of Denmark which you told me of, and which does as well for me as I need—or perhaps deserve. Dear Barbara, I trust this will reach you in good time. I am quite sure I will have more amorous adventures to recount in my next, and I count on you to tell me all the on-dits of the great doings at Vienna. It is singular that Lady Hornblower (born Lady Barbara Wellesley, a sister to the Duke of Wellington and daughter of the first Earl of Mornington) has been almost entirely overlooked by historians of the Regency and Napoleonic eras. 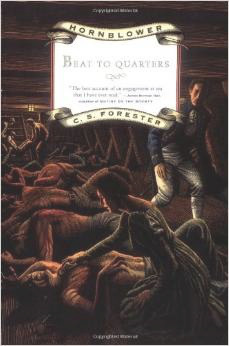 It took the diligence of C. S. Forester, eminent chronicler of the life of the great hero Horatio Hornblower, to winkle out some details of her life. (This feat has been equaled in recent years by the diligent research of George McDonald Fraser into the astonishing career of General Sir Harry Paget Flashman, and is an indication that conscientious scholars can still find a niche for their endeavors.) Although Lady Hornblower was higher in rank than Mrs Croft, their friendship began when they were both at a boarding school at Tunbridge Wells. It was renewed when Lady Barbara (as she then was) married her first husband, Admiral Leighton, and these two courageous and intelligent women became fast friends. The scanty available data may be sifted out from Mr. C. S. Forester’s account of Hornblower’s career, which was augmented by the further researches of C. Northcote Parkinson, in The Life and Times of Horatio Hornblower. Lady Hornblower’s presence at the Congress of Vienna was as hostess for her brother, the Duke of Wellington. Hornblower’s tone deafness is chronicled in several places in Forester’s multi-volume biography of the great hero, but although we know Hornblower was at Malta in the year 1806, the concert (Mrs. Croft gives no date) is not mentioned. Even Homer nods. “Light frigate” is one of the cant terms for prostitute, and despite being slang—which ladies were not supposed to use—is an appropriate term from an “intelligent and keen” naval wife—in a private letter.